Using an old Daytona 500 NASCAR race expression, the second Rice & Rose Sprint Triathlon on July 14, 2013, enjoyed "Bill France Weather." Pictured here are Paul Rice (wearing the Tour de France's King of the Mountains red polka dot jersey) his son, Paul III, and daughter, Haley, who helped out at the race. The event consisted of a 600 yard ocean swim, 12 mile bike and 3 mile run on the beach in Daytona Beach Shores. The approximately 100 competitors enjoyed glassy water, light winds and a low tide making for a wide, firm beach on which to run. For results of the race, go to: http://www.tigersharkevents.com/info/riceandrose.html. 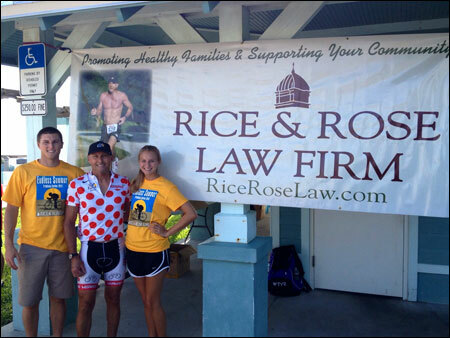 The Rice & Rose Law Firm is teaming up with the Daytona Beach Police Department and their Police Athletic League (PAL) to put on the inaugural Beat The Heat Triathlon on Sunday, November 10, 2013. For more information, click on this link: http://daytonabeachpolicefoundation.org/PAL-DBPD-Triathlon/.